The good news keeps pouring in for Old Louisville‘s Oak Street corridor. We recently surveyed the strengths and challenges of the street as its streetscape improvement project is wrapping up and profiled an amazing adaptive reuse project to create hundreds of jobs in the area. 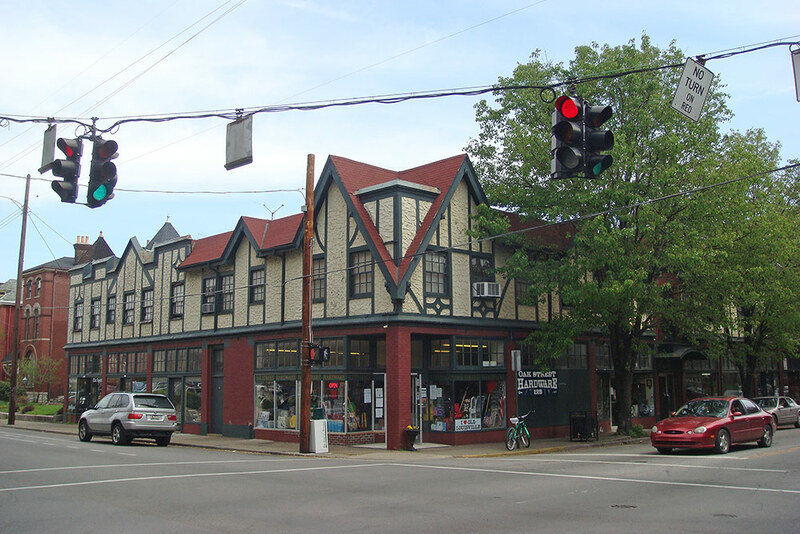 Now, the Arden Building, a two-story, Tudor mixed-use structure on the corner of Second and Oak streets, has been sold and will be renovated including some new neighborhood-serving retail. Alex Parets moved to Louisville from his native New York a few months ago after tiring of his finance job in Greenwich, Connecticut. This summer, he began looking at cities where he could begin investing in real estate. He first considered Charleston, SC, but quickly realized that city presented challenges to entering the market. “I felt like I missed the boat a little bit,” Parets said. The next step was to find a property. “I found this Oak Street Hardware building and it all made sense,” he said. The property had been listed for $460,000. 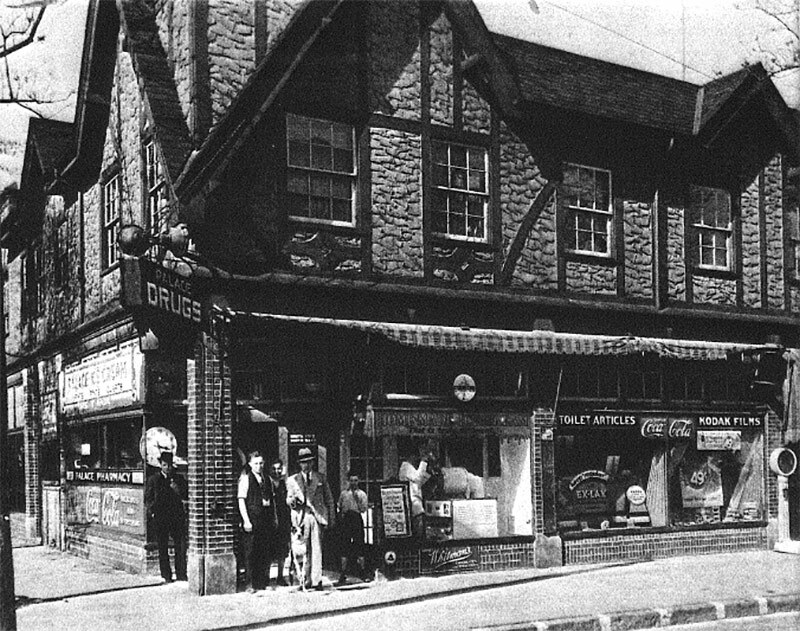 The building’s previous owner, Lee Jones, also owns the building’s anchor retail tenant, Oak Street Hardware. Jones is retiring and will close the store by the end of the year. He had previously considered moving the store to another building west on Oak Street with help from a $40,000 METCO loan that stabilized the building. Currently, the 14,500 square foot building is fully occupied with five tenants: an upholsterer, an antique store, a barber shop, a salon, and Jones’ hardware store. Parets said he doesn’t want to go in with a heavy-handed approach of raising rents across the board. He believes in the retail potential of Old Louisville, with its density and increasingly wealthy population, but is confused that so little retail exists there currently. “I don’t really understand Old Louisville because it does have a really big population, yet there’s nothing there. It’s such a bizarre thing. There should be retail there—it can handle it,” Parets said. Upstairs, the building’s ten apartments—eight studios and two single-bedroom units—are also fully leased. Parets said he will renovate and modernize the units as they become available. But redeveloping the Arden Building might only be Parets’ first big move in Louisville. He said he is looking around for other underutilized properties in Louisville’s core and is considering the feasibility of taking on more projects—he said he already has friends from New York calling who are interested in investing in his Louisville initiatives. But for now, Parets is focusing on restoring Oak Street. Oak Street can handle retail, restaurant, take out, pizza, it’s not any more challenged than Frankfort or Bardstown other than perception, zip code, and highly undesirable pollution and noise from semi trucks. The Arden belongs to that last era of development in the neighborhood when density and connectivity made for an active sidewalk. Old Norton Hospital was across the street. Row houses lined Fourth and Second, as well as St Catherine. 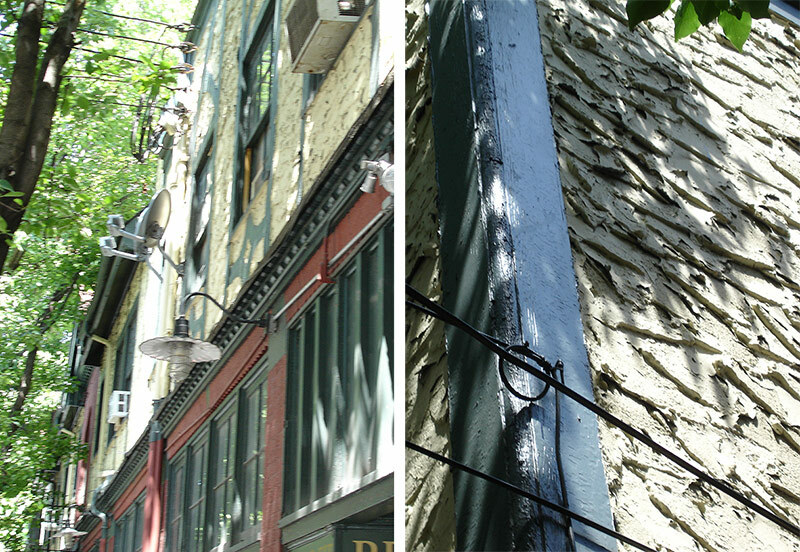 Have you seen the uncovering of the old partial 1904 Mason Maury facade of the Women’s Club on 4th?! We knew it was under there somewhere!? So much potential ……! The problem with Oak St. that no one wants to hear is that 4th and Oak serves as a major artery for TARC, and there is nothing around it but halfway houses, rehab facilities, low-income housing and shelters all around this area. The number of mentally ill and homeless people in this area is astounding, and even as a longtime resident, I advise people to avoid it. That’s the reason no business can survive, barring a few exceptions. Unless you’re selling phone cards and single pints, or you have express political connections to address those things, I’d keep looking. What a mess. The problem surrounding oak street are the low income housing, bums, mentally ill and ratchet meth heads who roam the streets around there. They really should clean that area up and migrate them people elsewhere. Those people have no pride in what they have and gets everything handed to them and don’t have to worry about a thing. The area could be amazing and flourish with great local businesses but trash can only appeal to other trash hence no legitimate NICE businesses can survive in that area. Nobody around there takes responsibility for their surroundings because they are lazy and just don’t care to. Take the trash out, bring old Louisville back in a good way. It’s a pathetic and sad area to drive through when your driving around other parts of town. I think the author jumped the gun quite a bit here. The sale of this building is nothing close to a “win” for the Oak St corridor. If the new owner corrects the numerous issues with the building it certainly ‘could’ be a win. The plan described in the article certainly has the makings of failure written all over it. A fried chicken restaraunt and bar? Where has that concept ever been successful and brought improvement to a community? The 10 apartments on the second floor are in terrible shape and filled with aweful tenants paying unreasonably low rents. If they are renovated 1 at a time as they become available (which last I checked all were on month-to-month leases) then you’ll never be able to attract good tenants. What quality tenant wants to pay market rent to live in a nice apartment surrounded by 9 other mentally unstable, drug addict neighbors. I sincerely hope that Parets can do something nice with this building and make it the showpiece of Old Louisville that it has the potential to be. We have enough slumlords doing the bare minimum to properties around here – we don’t need this showcase building mismanaged and poorly remodeled as it will could easily be a blight on the area and forestall other improvements if it is not done properly. We plan on investing in and restoring the building and, as you say, making it the showpiece of Old Louisville it once was and has the potential to be. However, I don’t appreciate you calling the current occupants “aweful”(sic) and “mentally unstable, drug addicts.” Those are rude and unfair mischaracterizations. We are doing our due diligence to make sure we have stable long-term tenants. The terms of our leases will be between us and our tenants. As for the future of the Oak Street Hardware space, wait until the official announcement. It will be awesome. There are definitely a few headwinds on Oak Street that have been mentioned in previous comments but we believe in Old Louisville’s potential and want to contribute to the redevelopment of the Oak Street corridor. @Alex – Alex I’m in full support of your attempt to foster a revitalization of the area. Fried chicken? Really!? How about a healthier option for the overwhelming amount of low income residents in the area instead of promoting heart disease. I encourage everyone next time they visit Cincinnati to swing through the “Over the Rhine” neighborhood. If you are unfamiliar, OTR is an area just a few years ago that was much more “drug/bum ridden” than Oak st is today. Fast forward to today, this area has seen a renaissance and is THE place to go for food and good times. To address your point on fried chicken, OTR has a great restaurant/bar there called The Eagle that sells craft beer and fried chicken, that’s it and its wonderful. I was blown away by the experience. Also, its not like the locals in the neighborhood are ignorant either. You have to walk past the bums on your way to OTR, but they aren’t ALL trying to beg/borrow/steal something from you. Don’t let the bad 1% sway your judgement on the other 99%. Every neighborhood is inherently good and wants to do better, they just need opportunities like this to get people/money to the neighborhood. I am all for development in that neighborhood, its just what we need to bridge the gap from Old Louisville to Downtown (lite rail would be great too). Lite rail will never happen in a city that talked about building a bridge for 50 years. How do you mean we “share” our homeless with the rest of the nation? If loading them in busses and driving them to the next city is the solution, I think we can all agree that is an unsound one. Instead, we must first identify what a “homeless person” is. I think lumping all types of people on the streets as “Homeless person” doesn’t help solve the problem. The stats don’t single out those that are temporary homeless from rough times (e.g. getting divorced and fired at the same time a medical bill hits). That can put alot of people on the streets real quick, but it doesn’t mean we can’t help to get them out of that rut. Its the social stigma we place on those in temporary homeless situations that turn it into permanent homeless situations. Additionally, its the drug addicts that way down on the community and stay in perpetual homelessness. the mental and physical problems these addicts suffer from will prevent them from ever really getting fully acclimated back into society. Cities and their non-profits are just not built in a robust fashion to handle everyone at all times (i.e. The Healing Place). We all know where to find the meth-heads or crack heads. Go to any area with high vacancy rates and you will find the drug addicts squatting in a foreclosed building or shotgun houses. If you want to rid a city of those individuals, then simply invest in rehabilitating these properties (look for Gill Holland in Portland). If you take a neighborhood and kick the squatters out through rehabilitating foreclosed properties, the neighborhood WILL improve. Drug addicts will find other places, but at-least it will be one less neighborhood(in our city) they can do it in. Eventually over time, hopefully this improves the situation and the numbers. But that is a conversation for another day…. Jon C., I wrote “county,” not “country.” However, I’m incomplete agreement. I couldn’t find support of the busing practice but I’m well aware that’s how it’s done. I agree completely. Ahh, I should probably read twice before responding. Your comment makes much more since now, but it does provide a paradox. Here we are wanting to reinvigorate downtown, dare I say gentrify it. My one concern is that we would see even more “White flight.” the suburbs we know here in the South and East end could become the new hot-spots for increased vacancy. I’d worry we create some type of Detroit phenomenon, where Oldham County and surrounding counties become the new Suburbs of Louisville. I’m all for improving downtown, but I am even more against suburban sprawl. I think that’s already happened. The key is drawing them back. I really liked that hardware store. It might not have been that exciting, but it was practical and useful.